Speed Bump | Alpine Products, Inc.
Standard 2-5/8″ high x 12″ wide. Low profile 2″ high x 12″ wide. Great for parking lots, parking garages, and alleys. Low profile designed for golf cart paths. Two, 1-1/4″ channels on bottom for drainage, pipe, wire or cable. Made of tough, recycled rubber with an UV stabilized virgin rubber overlay. 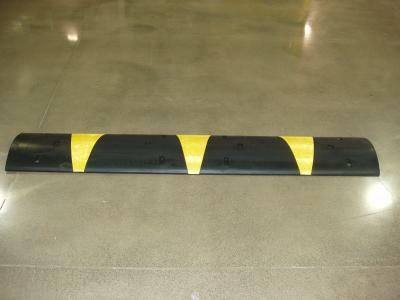 Molded-in yellow directional stripes are durable hypalon, last much longer than paint!